Senryu, like haiku, are usually one to three lines in length but whilst haiku focuses on nature and the world around us, senryu homes in on human nature and the way our human minds function within our many environments. Senryu may or may not include aspects of the natural world, but if they do, they do so with an emphasis on the way we as human beings perceive those aspects and how they interact with our own psychology. In this way, senryu are often, though not always, humorous and are frequently complemented by a sharp, sometimes wicked wit. Kyoka is often regarded as being to tanka what senryu is to haiku. They are usually five lines in length and read like tanka. M. Kei, writing at his blog, stated that “Kyoka is anti-tanka. It is parody and satire. It makes fun of stuffy old tanka and offers new subjects and new approaches”. Whilst I agree with all of the above, I made the decision to take on Prune Juice based on the views I share with the journal’s previous editor, Alexis Rotella – that senryu and kyoka allow us an outlet. Both writer and reader alike may find in senryu and kyoka a vent, a portal, an opening through which we can feed our minds and end up cleansed. Though confined to their small spaces, senryu and kyoka allow us considerable freedom to explore ourselves, our idiosyncrasies and our place within this mad, mad world. And senryu and kyoka seem to work no matter where you are or what time it might be, whether the glass is half full or spilt, whether you’ve paid the rent on time or have to open the door to the landlady and her broom, whether you jump over or perform a backward, half twist and straight dive into the puddle, whether you’ve a broken heart or a fractured femur, whether growing tomatoes or growing pains, whether it’s sugar or a fly in your tea – write that senryu, write that kyoka and send it to Prune Juice. I would only like to reiterate that senryu and kyoka do not have to be humorous. While often satirical and witty, because they deal with a range of human emotions, these poems can also be serious and sometimes even dark in tone. “Senryu is a short poetic genre which focuses on people. Men, women, husbands, wives, children and relatives. It portrays the characteristics of human beings and psychology of the human mind. Even when senryu depict living things such as animals, insects, and plant life, or when they depict inanimate objects, they are portrayed with the emphasis on their human attributes. 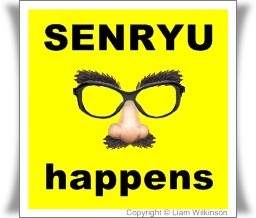 Senryu are not all strictly intended to be humorous. Many senryu express the misfortunes, the hardships and woe of humanity”.